Now we all know that Ipoh is famous for her food. This city, nestled amongst limestone hills provides a haven for many food aficionados. Tales of people making the 3 hour plus drive to Ipoh just for breakfast is not uncommon. 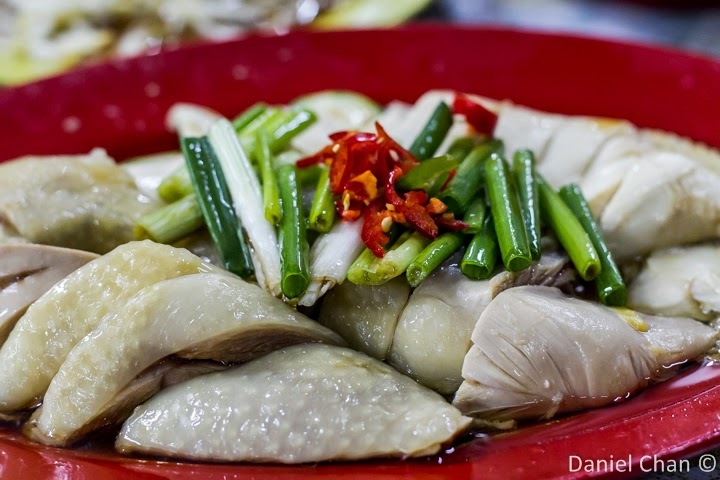 Tell anyone that you have gone to Ipoh and they will probably ask you about the chicken rice. Ipoh serves chicken with a slight twist. You are not limited to the conventional chicken-buttered-rice as we get it in Kuala Lumpur. Some stalls offer plain white rice and some offer Ipoh’s famous silky smooth flat rice noodles, (Hor Fun or Kuey Teow) served with a large serving of fat bean sprouts ( must the be water in Ipoh, things are a bit bigger here :P) . I managed to get into an area called Buntong which had a Jln Guntong. The restaurant is actually a house that has been made into a restaurant. It is Jln Guntong, Buntong, Ipoh. Anyways, there is a highly recommended chicken-noodle-bean sprouts-I-don’t-know-what you-call-this-as-it-is-not-chicken-rice, dish. Just look at the picture. The hor fun is smooth and soaks up the chicken broth. Time to chow down on the chicken. Yes, they do taste marvelous and on weekends, do go early around 6-630pm as there will be huge crowds after that. Order a dish of pork balls and whatever you see there. This place gets busy really fast especially on weekends. Chicken gizzard and some pork. Ipoh chicken is just good. I have yet to encounter an experience that challenges that statement. Price is reasonable at around RM7 per head for a lot and you may want to take down these GPS coordinates and load them into Google Maps for yourself :4.593269, 101.064745. Landmarks : Near a Caltex.